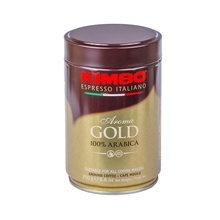 Kimbo is the company founded by the Rubino Brothers in 1963 and from which the Kimbo trademark was created, a name that evokes exotic lands where coffee beans are cultivated. The growing success is definitely due to the strict loyalty given to tradition and the excellent quality as well as the money invested in advertising and corporate infrastructures. This is evident in the Melito factory of Naples that extends over 40,000 square meters, where the instruments and production processes are constantly updated and always guarantee the achievement of very high production standards while respecting the environmental policies. 1 kg 250 g 500 g Ground Whole bean 100% Arabica 50/50 70/30 80/20 95/5 dark Espresso Sort by: Price (Low to High) Price (High to Low) Product name a - z Product name z - a Highest rate Lowest rate New in!